The Shelford Channel is built around Rupert Neve’s first new transformer-gain, class-A microphone preamplifier in over 40 years, the “best-of-the-classics” inductor EQ section from the Shelford 5052, a tone-packed Diode bridge compressor, the analog power of variable Silk saturation, a new dual-tap transformer output stage for maintaining headroom or allowing the full driving of the Channel without clipping standard converters, and twice the operating voltage of vintage designs. With this classic topology, the input transformer design is extraordinarily challenging, and the RN4012 transformer utilized in the Channel went through many generations before Mr. Rupert Neve was satisfied. 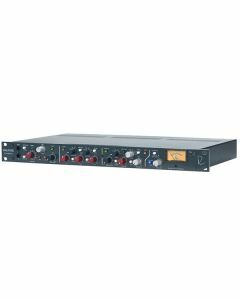 This transformer provides the first 15dB of gain, with the rest of the 72dB of gain provided by the discrete, class-A amplifier blocks controlled by a stepped attenuator and precision trim pot. Whereas Rupert’s more modern designs (e.g. the Portico Series) utilize a combination of TLAs (Transformer-Like Amplifiers) followed by an input transformer for pristine low & high frequency detail and galvanic isolation (see comparing input topologies notes), the Shelford Channel’s design directly couples the input transformer to the microphone line. When this new transformer is combined with its surrounding class-A input amplifiers, the result is the unmistakably smooth high and low frequencies of the most famous vintage modules in the world, yet with incredibly low noise and superior isolation. The mic pre section also includes a sweepable 20-250Hz high-pass filter, Mic / Line selection, 48V phantom power, and polarity reverse..
Like Rupert’s classic designs, the Shelford Channel’s mic input uses direct transformer coupling with 15dB of gain in the transformer itself. This extremely sensitive design utilizes the new RN4012 transformer, which spent years in development. The resulting sonic performance allows the mic pre to capture the more forward mid’s and slightly rounded off high and low frequencies of vintage designs like the 1073. The dual-tap output for the Channel’s RN2042 square-core output transformer creates both high and low headroom outputs without compromising the channel’s performance. The high headroom tap is designed capture a more pristine sound at high levels, avoiding non-linear coloration of the output stage and taking full advantage of the Shelford’s higher voltage design. The low headroom tap however is optimized to allow an engineer to drive the full voltage range of the Channel – adding dynamic tone with these same non-linear “colorations” – without clipping most professional interfaces (Max output level +19dBU). On drums, vocals, guitars and other instruments, this output lets you easily hit the transformer’s “sweet-spot” of non-linear harmonic content, which can bring a recorded performance to life in a way that other effects can’t. Another advantage of the Shelford Channels’ transformer balanced output stage versus vintage modules is the addition of the variable Silk & Texture circuitry, which allows complete control over the harmonic content and saturation of the output transformer. With Silk disengaged, the output is modern and pristine, yet still retains Rupert’s signature larger-than-life transformer sound. When engaged, the harmonic content – predominantly 2nd order and 3rd order with no high order distortion – can be dialed up to several times beyond that found in his vintage units like the 1073. This is further controlled with Silk Red and Blue modes, which emphasize harmonic content generated by the source’s high frequencies (Red) or low frequencies (Blue). This LED is dual function. When green, it indicates “Signal Presence” (a signal level of -20dBu). When red, it indicates 2-3dB below input stage clipping of the Mic/Line stage (+23 dBu while the pre actually clips at +25 dBu). This rotary switch provides further continuous gain adjustment over a range of +/– 6 dB. This push button switch engages phantom power on the microphone input. Please remember to press the mute button or turn down monitors and headphone sends or the channel the Shelford Channel is plugged into before toggling “+48” (and be especially cautious if you use pre-fader aux sends for headphones). The MID FREQ rotary switch has 6 positions to select the center frequency of the mid band EQ stage. This circuit utilizes an inductor and capacitors to shape the EQ curve, the same way as Rupert Neve’s console designs of the 70’s. The frequencies chosen are 200 Hz, 400 Hz, 900 Hz, 1.8 kHz, 3.5 kHz and 7.5 kHz. 200 Hz is especially useful for cuts on individual tracks within a dense mix. The compressor-limiter section is engaged with this button in. This may be the most useful control on the compressor because it is there for “confidence checks.” In particular, exercise it in both the quietest and the loudest sections of the song. Watch out for the compressor exaggerating noise and room sound in the quiet sections and chopping off transients and consonants in the loud sections, either of which suggest maybe too much compressor “action.” Conversely, losing quiet phrases or inadvertent clipping might suggest that a little more compression is warranted keeping in mind that you can always do a bit more in the mix but undoing over-compression is not fun and often not even possible. Sets the “slope” of the compression from 1.5:1 (minimal) to 8:1 (significant). For example if this knob is set for 3:1 then if the signal goes 15 dB over the threshold then it attenuates 10 dB and allows the output to rise 5 dB. In general, low ratios can not damage the music as much as high ratios but high ratios may be more useful to minimize clipping and OL lights in the recorder. This routes the High Pass Filter into the circuit that the compressor uses to determine level, commonly referred to as “the side-chain.” Note that the rest of the circuit and output will not have those lows filtered out. This function tends to be very useful because typical sounds often have more energy in the low octaves and can cause excessive compression. Our ears may tend to associate loudness with mids or high mids for some sounds and one may be wanting the compressor to regulate and smooth perceived loudness. Removing some amount of low frequencies that the compressor “sees” can help especially if one is compressing deeply (-8 dB or more). Often referred to as Make Up Gain. Considering the compressor is generally being forced to attenuate louder signals, some method of returning the average level to a volume comparable with the compressor bypassed is desirable. The GAIN control is mostly used for this purpose especially for those of us that depend on comparing compression to bypass. GAIN is often pushed for even more level than “bypass” because it is understood that the compressor should be providing some effective headroom (besides “louder is better” being the oldest trick in the book). This six-position controls adjusts the attack/release speed of the compressor. See the “Timing” section in the Compressor specifications page for timing values. Pushing this button changes the order of where the Compressor is in the circuit. . This just mixes the dry or raw, uncompressed signal and the compressed signal. Fully counter-clockwise is uncompressed and is very similar to not having the “COMP IN” button pushed in. Fully clockwise is 100% compressor-limiter path, and one can “blend” or mix how much compressed-limited signal vs. dry signal.